Before we get into the differences of a PLC’s and DCS’s, we need to talk about what each of them are designed to do. A PLC, or Programmable Logic Controller, is a computer that has been adapted to specifically meet the needs of any specific manufacturing process. These devices come in many different shapes and sizes, with many options for digital and analog I/O, as well as protection from high temperatures, vibration, and electrical noise. The invention of the PLC allowed computers to be streamlined into the industrial automation process. A PLC can be a single device calculating and executing operations, or a rack of different modules may be used to meet whatever your automation system requires. Some of the additional components include processors, power supplies, additional IO, interfaces, and much more. Every part works together to be able to run open or closed loop operations that are rated at high speed and high precision. Take a CNC machine for example; a PLC would be used to control positioning and motion, as well as torque control. These devices are popular because they are very inexpensive relative to the amount of power and how many hours you get out of them. A Distributed Control System is an automated control system that streamlines the functionalities of the various devices that are used throughout an entire work space. This type of system uses many different controllers to allow all the machining parts to talk to each other as well as computers that can input parameters and display information such as power usage, speed, and much more. These controllers are distributed geographically across a plant to allow for high-speed communication to the control room. When using different types of modules however, the system may require different communication standards such as Modbus and Profibus. DCS’s started coming to fruition throughout the 1960’s once the microcomputer was brought widespread into the market. Then what exactly is the difference? A PLC will probably be used to control a machine that isn’t too complex wheres the DCS can have total control of all the operations in an entire plant. The PLC is preferred in situations where the machine does not have to worry about meeting specific conditions inside the plant. These conditions typically involve operations that may need to stop or restart, as well maintaining precise temperatures. A DCS will be able to take advantage of all the aspects of an automated system, from the machines and sensors to the controllers and computers. An entire DCS is much more expensive than a few PLC’s, but each have their advantages in any given situation and certain automated systems will always require one over the other. 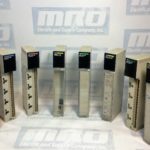 Visit MRO Electric and Supply’s website to see all of our available Programmable Logic Controllers. If we don’t have what you need listed on the site, contact us at sales@mroelectric.com or (800)691-8511 and we will be happy to help.